The saints look down from above. Image from here. The interior walls of the Aghtamar Cathedral are, in many ways, similar to the exterior walls (See Manuel’s Labor). Both teem with living things. These motifs arise from the pages of Scripture and from the narrative of Armenian history. Taken together, they connect an early medieval (10th c) present to a biblical past. It is a Christian connection presented without doubt: stern, stiff, and square. Symbols identify long-forgotten faces. View to dome from the interior. Image from here. The differences between the outside and the inside walls, however, are profound. Outside, the reliefs have dimension. Carved from stone, the figures rise simultaneously to meet the light and create shadow outlines of their own. Inside, the sun is reduced to stabs through window slits. This illumination moves slowly along the wall, inviting figures from the shadow and into the pageant one by one. What appears and disappears is gospel. Jesus heals, feeds, dies, and is resurrected. Dimension is sensed, but not from the blues and browns of the artist’s paint. These are flat. It is sensed, rather, in the vertical element of the interior space. Almost in an imitation of the theology worn on its sleeves, the building draws down into folds at the corners, then springs heavenward to a central dome. Inside the Church of the Holy Cross. We marvel at the artistry. It is a glorious effect and one that almost obscures the dispute that rages around the Church of the Holy Cross on Aghtamar Island. 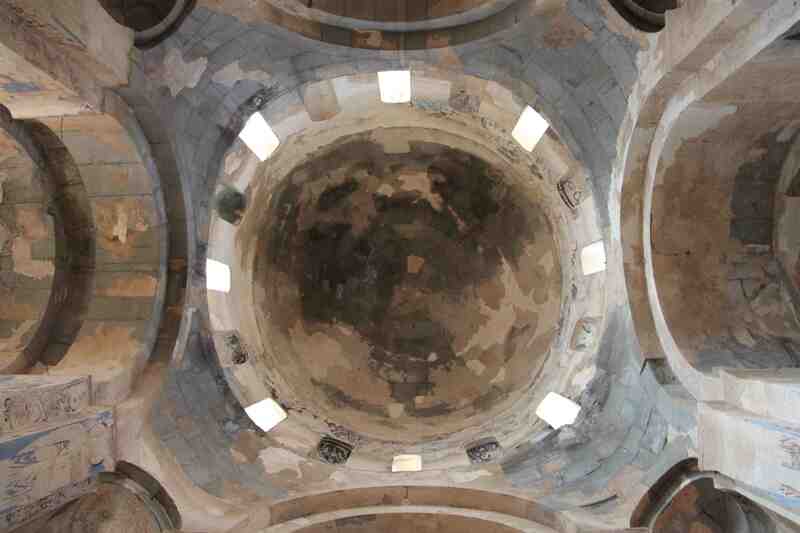 In a country where the memory of an Armenian Christian minority has been systematically erased, the building is an icon. It has survived acts of vandalism, “restoration,” relabeling, and a general “Turkification” of the site (An enormous Turkish flag flies from one end of the island). For the Turks, the building is lauded as a goodwill gesture toward the Armenian community. Reports suggest that the equivalent of 1.4 million dollars was spent in restoring the structure. Others question these numbers and the motivation behind the expenditure. Wherever the truth of this dispute lies, the secular mandate of the government refuses to allow public worship in this ancient place. The saints on their plastered perches must be content to view a hollow museum. Scenes from the Gospel story. On the left, Jesus raises Lazarus from the dead. On right, the triumphal entry of Jesus into Jerusalem. Image from here.